I’m tempted to say “we’ve heard that before”, but that would be cynical of me. And of course “free” and “open” aren’t quite the same thing, but lets come back to that in a minute. Like many commentators Reed focuses on the potential ability of OER to reduce the astronomical cost of textbooks in the US. While I agree that reducing the cost of textbooks is undoubtedly a Good Thing, (though of considerably less benefit to education in the UK), focusing on this as the primary benefit of OER, rather misses the much wider potential of open education. Replacing a paid thing with a free thing, is certainly good, but does little to challenge the commercialisation of the education, particularly if the free thing is being provided by a commercial behemoth. This is a point that Jim Groom raised on twitter. One final point…I was very interested to note that Amazon Inspire will be partially based on the Learning Registry, but that’s a topic for another blog post. 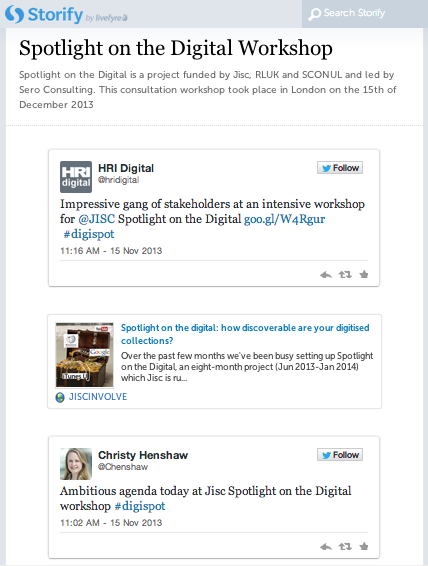 Last Friday I attended the Spotlight on the Digital technical focus group led by David Kay, of Sero Consulting and Owen Stephens, of Owen Stephens Consulting. The workshop was attended by institutional repository and archive managers, together with representatives of a wide range of bodies including the Welcome Trust, EDINA, the Archives Hub, Knowledge Integration, the Wikimedia Foundation and the British Library. The project is focusing on three user groups; researchers, students and university teachers. Two hundred publicly­ funded digital resources have been examined to assess their discoverability and a literature study of research on search behaviour has been undertaken. In addition to the workshop I attended, the project team will also consult with a group of library directors. It was a very interesting workshop that raised many important issues and highlighted some really innovative approaches to discoverability including; British Library Labs‘ Mechanical Curator project, which selects a small image taken at random from the pages of digitised works held at the library and posts it to tumblr ever hour on the hour; the Imperial War Museum‘s use of History Pin to crowd source information about their collections; and Cymu1900, a crowd sourcing project to transcribe Welsh place names. However what struck me at the end of the workshop was that we had barely scratched the surface of issues relating to the discoverability of educational content. Educational materials are frequently scattered, messy, poorly catalogued, lack persistent identifiers, and rarely reside in well managed archives or repositories. This raises a whole host of issues and problems in relation to discoverability. While context is an important aspect of discoverability for all kinds of digital artefacts, it is critical for educational content. 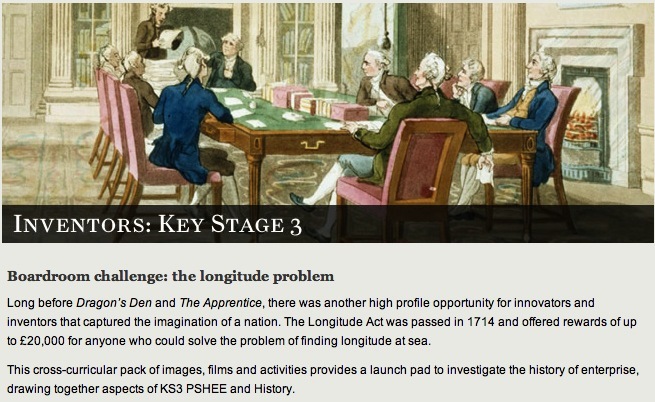 One inspiring project highlighted by Owen Stephens which addresses both contextualisation and educational resources is the National Maritime Museum‘s contextualisation of the digitised Board of Longitude papers by creating stories around the artefacts and developing Key Stage resource packs for schools. My Cetis colleague Brian Kelly, who also attended the workshop, has written up this thoughts on the role of Wikipedia in this context: Spotlight on Wikipedia: the opportunities and the risks.